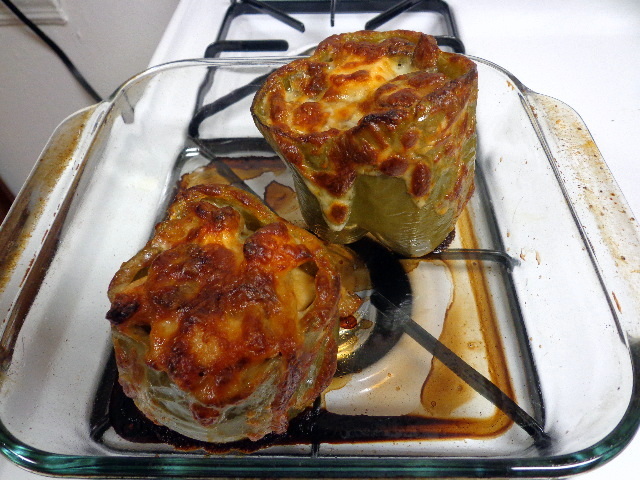 With caramelized onions and browned mushrooms, these are the best stuffed peppers I’ve ever made. They have everything a chicken cheesesteak does except for the bread. Slice the tops off of the peppers and clean the seeds out, taking care not to break through the bottoms. You are making little bowls out of the peppers. Place peppers cut side down on a microwave-safe plate and microwave for 4 minutes. When they are cool enough to handle, place peppers cut side up in a casserole dish. Heat 1 Tbsp evoo in a large pan over medium-high heat. Add sliced onions to heated oil and cook, stirring occasionally, until translucent. Stir brown sugar and 1 tsp salt into onions and reduce heat to medium-low. Continue to cook, stirring and scraping the bottom of the pan regularly, until caramelized. Remove onions from pan and set aside. Place another Tbsp of evoo in the pan and return heat to medium-high. Add sliced mushrooms and remaining tsp salt. Cook, stirring and draining liquid as needed, until mushrooms have reduced in size and turned a deep brown. Remove mushrooms from pan and set aside. Place final Tbsp evoo in the pan, along with sliced chicken. Saute chicken until cooked through, 3-5 minutes on each side. Use the side of your spatula to break cooked chicken up into smaller pieces. Return caramelized onions and browned mushrooms to pan with chicken. Reduce heat to low and add squeeze cheese. Toss together and cook until cheese is melted and mixture is homogenous. Scoop mixture evenly into the peppers, filling them to the top. Place casserole dish in the oven and bake 15 minutes. 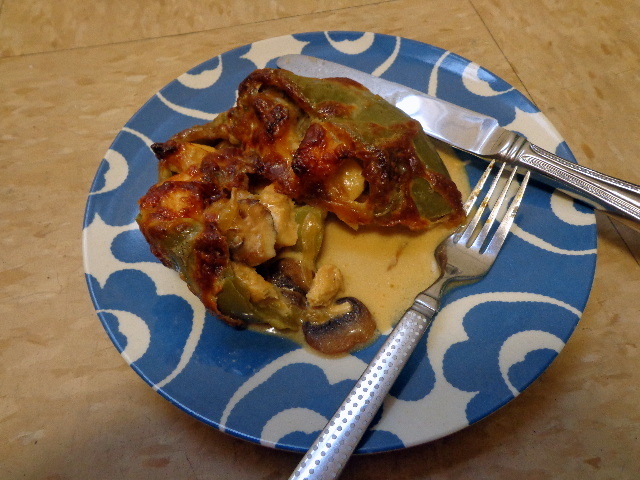 Remove dish from oven and top each pepper with a slice of provolone cheese. Return dish to oven and bake an additional 10 minutes. Remove from oven and allow peppers to cool for 5-10 minutes before serving.